The first victims of a riot are the rioters. That’s what the people of Bolivar City in Venezuela are learning right after the riots that took out 90% of its grocery stores in a matter of hours the weekend of December 16-18. Since 80% of the work force is dependent upon commerce, in addition to hunger, the population now faces a horrifying level of unemployment. The reason for the riots? Look to the government of Comrade President Nicolas Maduro, “son of Chávez” and leader of the Bolivarian Revolution, who has ruled by decree for most of this year. The direct cause of the riots, however, began the weekend before. In a country suffering the highest inflation rate in the world (estimated to come in at over 700% this year), with controlled currency dramatically overvalued, an economy utterly dependent on oil so that with slumping oil prices the imports (80% of what Venezuelans consume) imports have been cut to roughly a quarter of what they were two years ago, Maduro decided to deal with these problems by removing the highest value currency note from circulation. The 100 bolívar note (commonly referred to as “bolo” or “bolos”) is worth between 2 and 15 US cents, and the notes have lost so much value that most merchants have taken to weighing, rather than counting them. The problem was not so much that he removed a bill from circulation, but how he did it. Without having a replacement currency (the bill is going to become a coin), on Sunday, December 11th Maduro gave Venezuela 72 hours to turn in their bills to the banks. The decree, however, was published two days later, on Tuesday the 13th, since Monday was a holiday, so Maduro changed his decree to begin 72 hours starting Tuesday. At last, or so Venezuelan’s believed, they had until Friday, December 16, 2016, to turn in their 100-bolo notes. In exchange they got 50, 20, 10 or even 2 bolo notes. There were so many problems with this that they couldn’t all be enumerated here, but let’s start with the obvious. If a person brought in a box of 100-bolo notes (at two-cents value each, that might be a few of dollars worth) he would leave with two, five, ten, or more boxes of lower denomination bills. The logistics of getting those boxes home would be one problem fraught with even greater problems, especially given scarcity and cost of transport, crime, etc. There was also the problem of the lines to turn in the 100 bolo notes, some of them winding for blocks down the streets. So all of a sudden Venezuelans, who for two years have been cueing up to buy groceries, often spending up to ten hours in line for food, had to add into that another cue: this time to get rid of money before it became worthless. You get the picture and it looks like chaos, right? But that’s not enough. The day after the deadline, in the midst of protests, riots, looting, a generalized uprising in various parts of the country, Maduro decided to continue the use of the note until January 2, 2017. He announced that the arrival of the new currency had been “sabotaged” and had “not arrived as I’d wanted.” The “saboteur,” clearly, was Maduro: gun in hand, hole in foot. Here we leave Nicolas, the boy crying wolf again, and turn to Bolívar City where gangs led by “prans” or prison gang leaders were calling people out into the streets to loot stores. While national guard and police looked on with crossed arms (not daring to go up against the well-armed “prans” and their followers) a wave of destruction swept over the city. 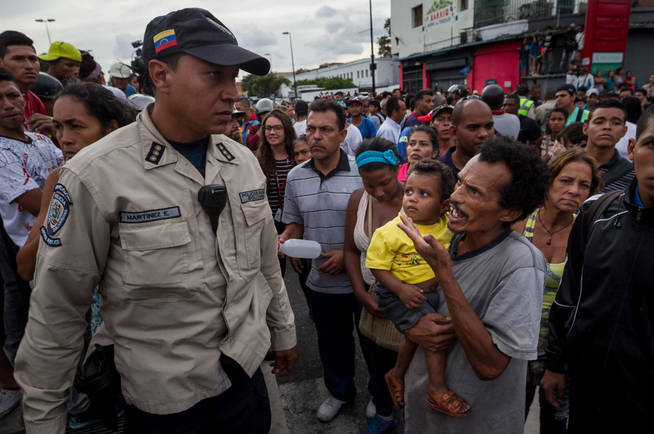 It was perhaps no coincidence that the stores belonging to Chinese merchants were the main victims, as Venezuelans, hungry and desperate, grabbed whatever they could find of value, and destroyed the rest. Given the dire situation of the country, it didn’t take much to get people out into the streets to take what they needed or thought they could trade for what they needed. The desperation is growing in Venezuela where it now takes 17 minimum wage salaries to feed a family, and even professionals (like my friend, a college professor) only manage to eat for less than a week on their wage. Certainly the tanking of the price of oil is one reason for the problems battering Venezuela today, but it’s not the only, or even the major, reason. Even in 2013, when the price of oil was hovering around US $100/barrel, I wrote that “the so-called ‘Bolivarian Revolution’ is bankrupt: morally, ideologically and economically.” But the socialist Left didn’t want to hear that, and further denunciations of the socialist wrecking-ball known as Chavismo (after founder Hugo Chávez) or the “Bolivarian Revolution” found no place in that or other left websites. So today the ineptitude, incompetence and irresponsibility of the “Son of Chávez”—who, indeed, replicates his “father” Hugo Chávez’s policies with stunning consistency—go unnoticed in most international left media. Ironically, the riots that destroyed Bolívar City began on the anniversary of Bolívar’s death, December 17th (1830), in a city named after him, and one of historic significance in his struggle for independence. Bolívar City was formerly known as “Angostura,” and it was the site of the Second Congress of Venezuela in 1819 where “the Liberator” gave his great speech to the Congress, a speech laced with Enlightenment ideas. Today that city where Enlightenment ideals were expressed in one of the most significant independence struggles of the Americas is now falling into darkness and chaos. The destruction of Bolívar City threatens to drag along with it the country where the project of “21st Century Socialism” promised a different outcome in Latin America to that of the socialism of the previous century in the USSR. It might not be that different: it may, in fact, be a whole lot worse.